The concept for SkyKitchen is to instruct you in the trained preparation of typical Peruvian dishes in the home of a local Peruvian with an unmatched view over Lima. Chef Yurac, (a name derived from a Quechua word), opens his home to you so that the class feels as if you are visiting a friend's penthouse. This is a hands-on class. You will be guided through the preparation of all the courses of a meal, allowing you to prepare an authentic Peruvian meal from scratch. You will prepare classic Peruvian cuisine with tools you can find in your own kitchen using the freshest ingredients that you can find in the plentiful markets of Lima. You will leave with detailed instructions and recipes for recreating the meal when you return home. Surely an experience you won't soon forget. "I enjoy it much more when I have the opportunity to cook with others, rather than cooking for a group of strangers, working alone in a restaurant kitchen with little to no contact with the people who eat my food. Furthermore, don't you agree it would be an unforgettable experience for you to be able to reproduce the exotic tastes from a vacation trip, even when you may not be a professional chef? SkyKitchen combines these two ideas into a unique experience. We will create an enriching time together, exchange knowledge, get to know each other and, finally, provide you with the tools necessary to take the taste and secrets of Peruvian cuisine home." 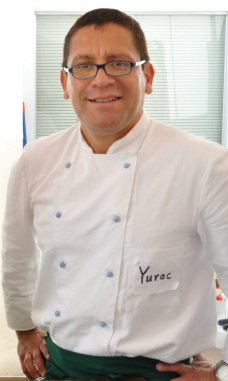 Yurac, a professionally-trained chef, started his career at Berlin's venerable establishment 'Reinard´s' in the nineties. After years of focusing on German, Italian and international cuisine, he returned to his Peruvian roots. He started cooking for Germany's Peruvian expat community and began attracting a large following of Germans. With this experience in mind he thought about how to spread Peruvian cuisine further into the world: SkyKitchen was born. Diego started his career joining the culinary school Le Cordon Bleu (Peru), when he was just 16 years old. He spent most of his time training in restaurants and hotels in the United States, like “The Peabody” in Orlando, “The Walt Disney Company” in Los Angeles, he had also been on board of Seabourn’s luxury yachts. In his hometown, Lima, he had worked in different restaurants: Quimera, La Bonbonniere and La Nacional. Thanks to his efforts, he had the opportunity to travel around the world, giving him the chance to get to know various types of cuisine (Asian, European, Latin-American, etc. ), and tasting new flavours and techniques. Now he’s willing to share his knowledges at SkyKitchen as a new Chef. 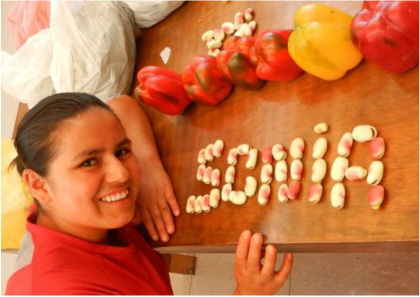 Sonia grew up in an Andean village an is bilingual Quechua and Spanish speaker. She has a profound knowledge of Andean plants, produce, their cultivation, and preparation. Sonia does most of the work in the background and also works on her Thesis at a Culinary School in order to become SkyKitchen's next chef.